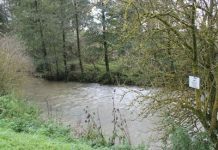 Following on with the theme of presentation this month, which is so visible on the river angling agenda nowadays, one cannot help but notice the considerable debate and discussion on the subject. Entirely healthy this, in my view, and it so refreshing to see an ever increasing number of fly fishers forging ahead with all manner of presentation possibilities, with and without fly line. This is even noticeable on British rivers now, and is not the domain only of the Europeans. The tools for the job are now widely available, in terms of long, soft (two and three weights) rods, particularly the XF2 Streamflex range from Greys, while Sage and Rio are the first to produce fly lines below the anachronistic AFTMA rating scale, in the form of lines that conform to zero weights or lower. More will surely follow, and these will undoubtedly come from the USA, along with the delightful developments in fixed line tenkara. Meanwhile, Fulling Mill have been the first of the British companies to give us the ‘tactical presentation leader’, the first commercially produced leader-to-hand rig that gets away from the hopelessly inadequate (for dry fly capability) French leader. Fly lines are unquestionably wonderful casting implements, and will always be with us in a variety of forms (though I hope we finally get away from the AFTMA system), while French leaders really did hint at a better means of presentation, with nymph. Adventurous river anglers, however, have certainly gone beyond the limitations of both, driven by a desire to achieve altogether improved technique, with a delicate leader system that can actually be cast, on the modern soft action rods as above. We have not developed a panacea here and there are limitations, and always will be. We have, however, made huge breakthroughs, and almost by happy accident. We were, after all, merely trying to achieve slightly better presentation and control of a dry fly, on the river, such that we could avoid drag for a longer drift, and at greater range than is possible with fly line. Beyond this, we discovered much more, the top of the list being minimal disturbance. For a long time I have been rather focused on dry fly. It is, after all, the easiest form of presentation offering visual evidence of control, as well as sight of an actual take. It also allows one to be more selective and is much easier to deliver on target. There is great mystique surrounding upstream dry fly fishing on rivers, and this is a charming legacy of the history of our sport, but no more than that. Every other method has greater demands on the anglers’ skill. Yet dry fly is my all-abiding passion. From March until some time in November, in all the rivers I know, trout and grayling are focused on the surface. Emergers, duns and spents represent the easiest targets on the menu of possibilities. Of course they take nymphs and other food forms, in great abundance; but it is seldom that they will reject the dries in and on the surface. Based on this rationale, many of us have concentrated on improving our dry fly technique. For the last month on the Eden we have been blessed with the best large dark olive and March brown hatches I can remember on this river. We have terrible problems with goosanders and modern farming – both of which are annihilating the populations of small trout and grayling – though we do have outstanding large brown trout (which are much more tolerant of the silt damage and, of course, can evade the predatory birds). The hatches back in March were of about an hour duration, though now they are three hours, with even the March browns going on for over an hour. Invariably they bring the trout right up into the fast water to intercept the duns before they reach the smoother, foam lanes on the glides. Three recent trips (over Easter) were exemplar: two to the Eden on the Appleby Waters and one to the Penrith waters of the Lowther. On all these visits I arrived at lunchtime, a little before the hatch developed and there was not a single fish to be seen. Rather than nymph fish, I walked the river, hunting for signs of trout. I did not have to wait long before the first rise preceded the familiar site of numerous large darks, followed by rising trout on the riffles. This situation is paradise for the river angler, no question, and it excites me as much now as it did when I observed it in my youth. The difference, though, is the approach, and this is what has utterly thrilled me. 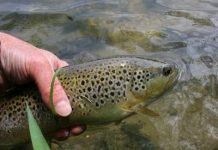 On each of these occasions, I fished a 19 quill plume tip on a presentation leader rig, and, once in position, managed to pick off almost every trout while barely moving half a dozen steps. Now, these are wild trout and though pre-occupied on the feeding frenzy, they are not soft targets. Also, while my wading technique is pretty quiet, it is not as good as say ten years ago; yet over these three visits more than 30 trout were caught, with four of them over three pounds in weight. More to the point: ten years ago I would not have caught half this number in similar situations, and would have been very lucky to catch a single one of the big fish. So what has changed? What has happened to the technique of an increasing number of river anglers that has precipitated this enormous change? Without a doubt it is the way we have addressed the issue of presentation, achieving that minimal disturbance in the 360° river space surrounding us out to a range in the region of 15 metres. Fly lines, even one and two weights, yield significantly more disturbance than many will care to admit, even outstanding casters, while they also interact significantly with the surface currents, resulting very quickly in fish-spooking drag. The quality of our flies, designed for purpose, is much better than hitherto, but more anglers now recognise that this is nothing like as important as how the fly behaves, how it is presented. My plume tips are not the best tied CDC dries one can find, by a long way, and when the Coq de Leon tails break off, or the quill unfurls, it hardly matters: so long as I can buff up the CDC and I can place them on the feed paths they are very rarely rejected – and if they are, it is because I have done something to spook the fish. Yesterday, on Lowther, I did this simply by a bit of careless wading, putting down a steady riser. Anglers often ask me to quantify the difference that l-to-h has made to my fishing. Difficult to do, but I think it has roughly doubled my catch rate. Then again, it has changed the way I fish; I tend to find that I have to move much less than in ‘fly line presentation days’, and I can also be more selective on my target fish. I should also admit to being more selective in the water I choose. I tend to pass over deeper, nymphy areas and search out the foam lanes on the glides and the riffle water. The latter has been a huge discovery in the last couple of seasons. 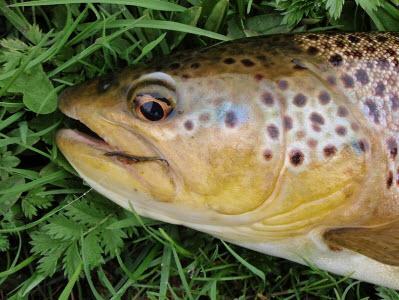 I am still astonished by the quality of trout one finds in remarkably shallow, fast water. 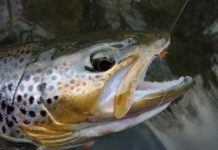 We used to think of such as being good only for trout hunting oxygen during low-water, summer months; but more than half my big trout during the early spring periods have come from very shallow water. One of my three pounders over Easter, came from glide water, while the others were from riffles of a depth that one could scarcely believe could cover their backs! In summary, for all those I know are interested in developing leader-only skills, I would suggest: go at it only with the proper tackle (see above). Always be aware of the need to minimise disturbance and choose your range and angle on a target fish carefully. Never underestimate dry fly and never underestimate the efficacy of a small dry fly. 17 is large, even during hatches of very large ephemerids such as March browns, olive uprights or danica mayflies; my standard is a 19, and if this fails I nearly always downsize, even though these are often tiny compared with the prevalent naturals. Finally, never underestimate shallow, fast water, for both trout and grayling. These fish can and do hide in broken water as easily as in the indigo depths of pools; and think of where their food is most plentiful. Three things matter to a fish: cover, food and oxygen.